Provide comfort for the family of Leslie Methfessel with a meaningful gesture of sympathy. Leslie Ruth Methfessel found peace December 15, 2018, at the age of 97. 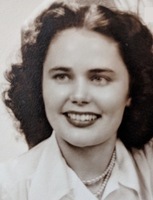 She was preceded in death by her beloved husband Paul, parents, and four brothers, Roland (Doreen) Brown, Robert (Betty) Brown, Donald (Frieda) Brown and Tom (Janice) Brown, and special friend Jean Witte. Loving mother of Paul Rand (Ardis) Methfessel and special mentor and lifelong inspiration to her niece Kristin (Andrew) Cmeyla, Leslie is further survived by the wonderful nieces and nephews she was so proud of: Barbara (Chris) Egan, Patricia (Vince) Kolber, Robert Brown, Nancy (Rick) Osborn, Jim (Carol) Brown, Susan (Tim) Kay, Linda (Glenn) Cameron, Karol (Jim) Cink, James Brown, Ronalee (Mike) Monroe, Geralee (Augie) Ray, Betsy (Jay) Hickey, and Megan (Mike) DeGeorge, as well as many great and grand nieces and nephews and friends. Leslie was born in Minneapolis, Minnesota to James Robert Brown and Caroline Nelson Brown and was raised in Milwaukee, Wisconsin. She attended Downer College in Milwaukee and met her future husband, Paul, on a blind date arranged by her good friends, Faith and Bob Zentgraf. Paul, a WWII hero who never spoke of his heroism, returned from the war and they were married on August 16, 1947. Leslie became a fourth-grade teacher for MPS when their son Rand was 9 years old, and she retired at age 55. She and her dear friend Jean Witte enjoyed traveling and attended many Elderhostels. Leslie was a lifelong learner known by all for her quick wit and interests that ranged from poetry and crossword puzzles to comparative mythology and chaos theory. The Swedish Christmases celebrated at her lovely home were the delight of her entire family. All who knew and loved her benefited from her wisdom, wit, kindness and the joy she took in all she did. A beautiful woman admired by many, she was the first to notice the treasure to be found in others. She will be deeply missed. A Celebration of Life for Leslie will be held on Saturday, May 4th, at 1:00 at the Village at Manor Park - Palmer House Chapel, 3023 S. 84th St., West Allis, WI 53227. (Parking lot and entrance is on 84th and Oklahoma Ave). The service will be followed by a reception in the Game Room located next to the chapel. In lieu of flowers, memorials to the charity of the donor's choice would be appreciated. To send flowers in memory of Leslie Ruth Methfessel, please visit our Heartfelt Sympathies Store. Provide comfort for the family of Leslie Ruth Methfessel by sending flowers. I am deeply saddened . My sympathy goes out to the whole family. Kristin thank you for being my friend I hope to see you again.